As promised, here are the Christmas Math Centers for Kindergarten. 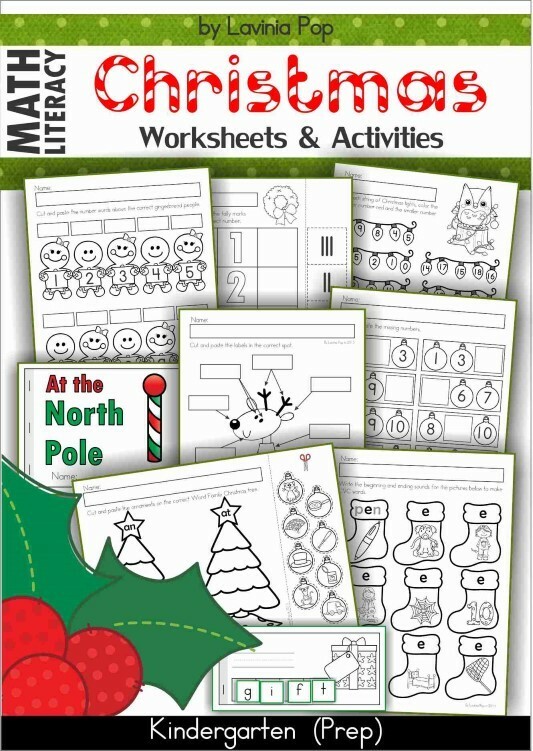 If you need literacy activities, be sure to check out the Christmas Literacy Centers here! PLEASE NOTE: This blog post contains sample pages from my Christmas Math Centers for Kindergarten packet. You can download the free sample pages by clicking on the photos. 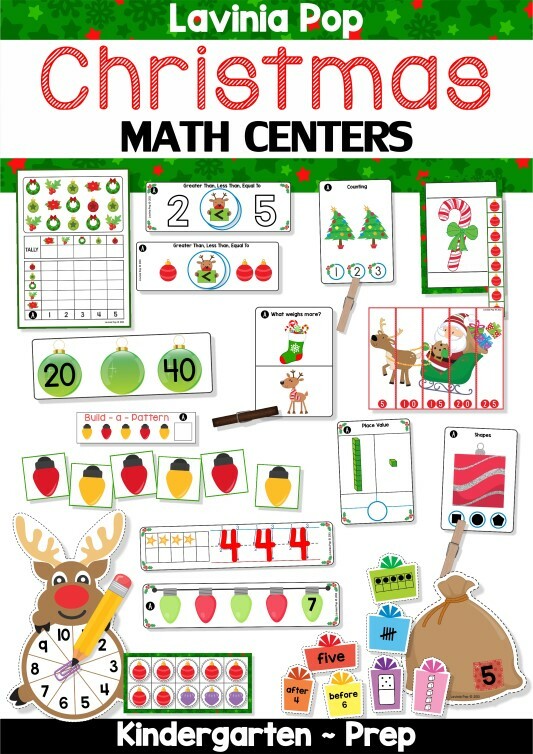 To purchase the complete Christmas Math Centers for Kindergarten packet, please click here! To prepare the cards for use in a write and wipe center, print, laminate them, and then cut them apart. The intention of this activity is for children to practice correct number formation with a dry-erase marker. The cards can be kept in a book-like format by punching a hole in the top left corner and securing the cards together with a key ring or a pipe-cleaner. Print, laminate and cut out the picture cards. The aim of this activity is for children to count the objects on the cards and to clip a clothes peg on the correct number. Alternatively, children can use dry-erase markers to colour the correct number. To prepare this write and wipe activity, print, laminate and cut out all the cards. 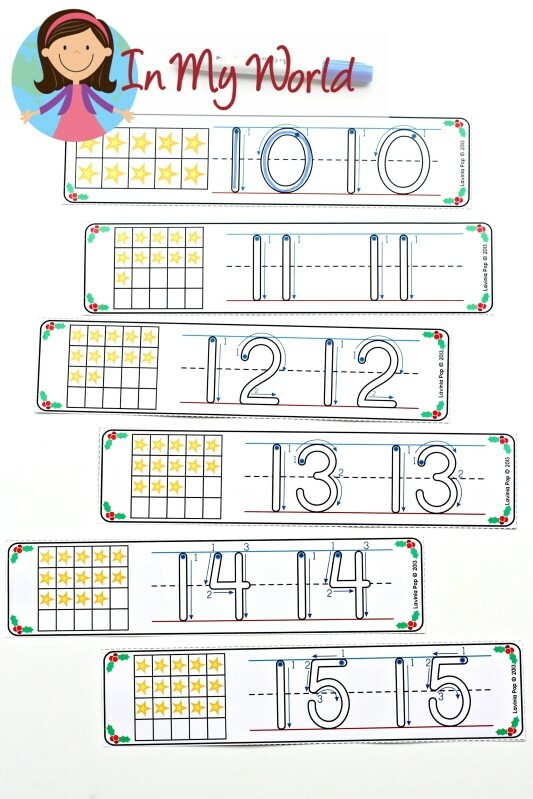 The aim is for children to count backwards from the number on the end light and write the missing numbers using a dry-erase marker. To prepare this activity for use, print and laminate all the cards and reindeer signs. The aim is for children to identify which group is greater, which is less or whether the groups are equal. To prepare this activity for use, print and laminate all the cards and reindeer signs. The aim is for children to identify which number is greater, which is less or whether they are equal. To prepare this activity, print and laminate the cards. The aim is for children to count and represent their findings on the graph by colouring the appropriate number of squares with an erasable marker or crayon. They are also asked to represent their answers by drawing tally marks. To prepare the cards for use, print, laminate and cut out all the cards. The aim is for children to match the different number representations on the gifts to the correct sack. To prepare the cards for use in a write and wipe center, print, laminate and cut the cards apart. The aim of this activity is for children to write how many tens and one in each column and then the total amount in the middle circle. To prepare this write and wipe activity, print, laminate and cut out all the cards. You may like to make a hole in the top left hand corner of each card and secure all the cards together with a key ring, pipe cleaner or ribbon. The aim is for children to identify the missing number on each card and write it using a dry-erase marker. Print, laminate and cut the puzzles into pieces, storing each puzzle in a separate bag. The aim is for children to arrange the puzzle pieces in numerical order to reveal the picture. Print, laminate and cut out all the cards. Make a spinner for the reindeer card by placing a pencil in the middle of a paper clip and spinning the paper clip with your finger. To play, children spin the spinner and represent the number spun by placing tokens on the ten frame. Children then fill up the rest of the ten frame with different tokens to make 10. To prepare for use print and laminate all the pages. The aim of this activity is for children to build a pattern following the example from one of the cards. They then need to decide which picture goes in the empty square to complete the pattern. Print, laminate and cut out the cards. The aim of this activity is for children to determine the shape of the ornament and clip a clothes peg to show their answer. Alternatively, children can use dry-erase markers to colour the correct shape. To set up for use, print and laminate the cards for durability, then cut along the white lines to separate the cards. Print and laminate the measuring strips. The aim is for children to use the measuring strip of ornaments to measure along the arrow from one line to the other line. You can use other items such as coins, small erasers, token and counters, etc. Print, laminate and cut out the cards. The aim of this activity is for children to determine the object that weighs more and clip a clothes peg to show their answer. If you’re looking for some black and white printables for Christmas, you can view them here in my TpT store! These look great. Think I will get some. These printable look amazing ! Perfect for my kindergarten class in the next month.